Z71, Sunroof, Leather Bucket Seats, LED Cargo Box Lighting, Spray-On Bed Liner! This dependable Chevy Silverado is a straightforward, good-looking pickup that will work in nearly every circumstance. Our Silverado 1500's trim level is LTZ. The Silverado 1500 LTZ is as smart as it is strong, offering technology to keep you connected like OnStar with 4G LTE, Chevy MyLink with an 8 inch color touchscreen and bluetooth streaming audio. Comfort and convenience features include a rear vision camera with dynamic guide lines, 60/40 folding bench rear seat, remote vehicle start system, stylish aluminum wheels, an EZ lift and lower tailgate, a spray in bed liner plus it even comes with power heated front seats that allow for 2 memory settings. 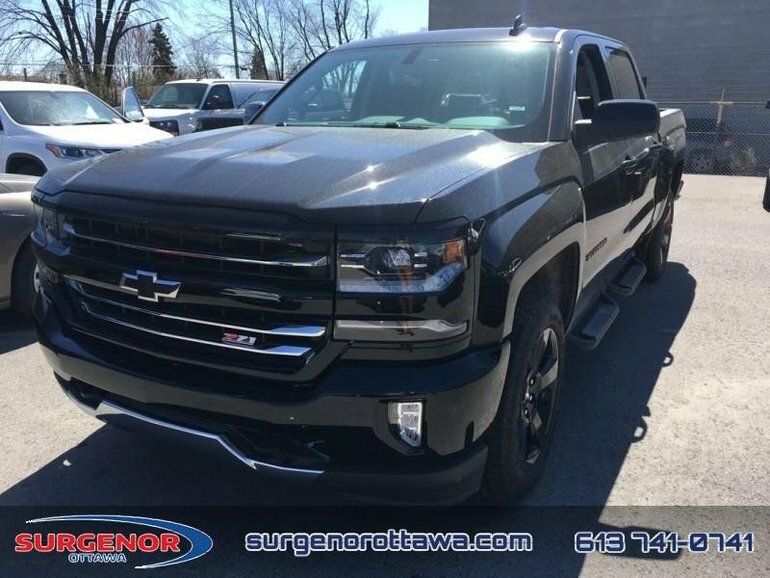 This vehicle has been upgraded with the following features: Z71, Sunroof, Leather Bucket Seats, Led Cargo Box Lighting, Spray-on Bed Liner, Tri-fold Hard Tonneau Cover, Leather - Jet Black. Total rebate of $8200 is reflected in the price. Credit includes $4700 Delivery Allowance and $3500 Non-Stackable Cash Purchase Assist. Credit is available in lieu of subvented financing rates. Incentives expire 2018-08-31. See dealer for details. Ce véhicule, Chevrolet Silverado 1500 LTZ - Z71 - Sunroof 2018 vous intéresse?